The other day we went to Tchai Ovna to see Lily O'Lee, The Hermit Crabs and California Snow Story. It was a really nice evening and I truly regret not having discovered this cosy tea house earlier. It's very small, so maybe it was just as well I left the opera mid-performance to get there just after eight. How typical, walking out on a baroque opera to go to an indiepop show! I met two guys from Hello Saferide, and to my sorrow, found out that Sounds of Sweden had been on a Wednesday this week! Which means I could have gone to that as well. I'm really dissappointed that I missed The Poems. 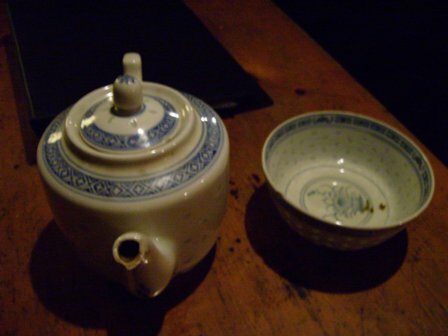 I consoled myself with a pot of dhesi tchai. I also met a very nice man called David, a longtime Glasgow indie scenester I guess we could call him. Unfortunately my camera battery gave in right at the beginning of the evening, so this is the only photo I have to show for it. It was equally a pleasure to meet David from California Snow Story, who gave me one of their new, cute badges! And the album will be out on Letterbox on January 29th. 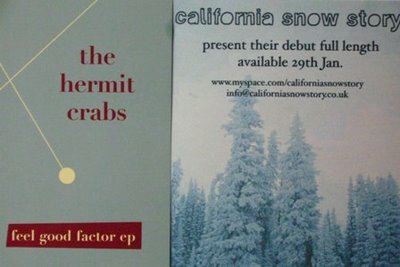 It looks like the next two months will be a really eventful record releasing period, with the new Matinée releases, the California Snow Story album, The Orchids' new one and the A Smile and a Ribbon debut! The Hermit Crabs made a very good impression on me, I've never heard them before. Their second guitarist was playing an electro-acoustic, nylon-stringed guitar instead of his electric, which made the sound more interesting. And they'd also recruited a new violin player for the night! California Snow Story was even better. They only played one old song, I think, and most of the new ones were quite slow. But in that beautiful Postal Blue way. Maybe it was the guitar sound that made me think of Postal Blue - you know, muted and warm, low on the treble? I'm very much looking forward to that album! Oh, and they played "Candy Says" too, which you can't hardly go wrong with. Next weekend we might go to the play Do I Mean Anything To You Or Am I Just Passing By?, the one The Pastels have done the music for. It was great to meet you on Thursday, young chap. I'm really glad you enjoyed CSS & THC. I love Sandra from CSS's voice!! !